5 of 5 stars on Goodreads. If this book were comprised of mere images, it would be fascinating, all on its own. Our fascination for that which we are not normally allowed to otherwise experience gets to be too much when we think about it. It's normal to want to know what goes on in the world around us. For us, we lived amongst Mennonites in Seminole, Texas for about a year and it was fascinating. The women who worked in the fields normally dressed in polyester dresses with tennis shoes, an apron, a head piece and sometimes, they had young children with them. The men gathered at certain coffee shops and there was always a palpable division between the Mennonite and us, the, "Whites." The book has a lot commentary and history as well. It is well done. For certain. Beth Oberholtzer is a book designer, editor, and author from Lancaster, Pennsylvania. 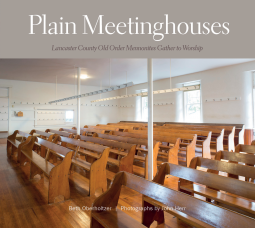 John Herr is an architecture photographer, also from Lancaster County, whose work documents contemporary and historic buildings. Beth and John are descendants of Swiss-German Mennonites who in the early 1700s escaped religious persecution and settled in Lancaster County.